to be held at Seoul National University (SNU), Korea in October 27th, 2017. The Conference is co-hosted by Lao Renewable Energy Assistance Center in Energy Climate Policy Institute (ECPI) and SNU Asia Center (SNUAC). based on cooperation between Korean civil society and local educational institutions. and related education in Xayaboury, Laos) done by Lao Renewable Energy Center and assess the value of those from an academic perspective. to build a governance from Korea for the sustainability of the renewable energy assistance projects. She has been supporting renewable energy project in Laos as a Program manager in Lao Renewable Energy Assistance Center since 2009. Speaker Lamthong LATHDAVONG is Department Chair of Physics in National University of Laos. He has served as a manager for the renewable energy education and training. Speaker Inthee CHANPASEURDHER is Statistics Planning Director in Office of Education, Xayaboury, Laos. Lao Renewable Energy Assistance Center signed a Memorandum of Understanding(MOU) with Office of Education, Xayaboury, Laos. Speaker Sunjae LEE is Advisor of Phoudindaeng Youth Center, Laos. He led to be a social consciousness for the renewable energy technician. Speaker Meejeong JANG is Representative of Korea Environmental Education Center. a textbook on renewable energy called ‘Sabaidee, Environment-Energy’, to teach children the importance of sustainable development in Laos. Speaker Eunhui EOM is Research Fellow in SNU Asia Center. Her Research area is Environmental Geography & Southeast Asian Studies. 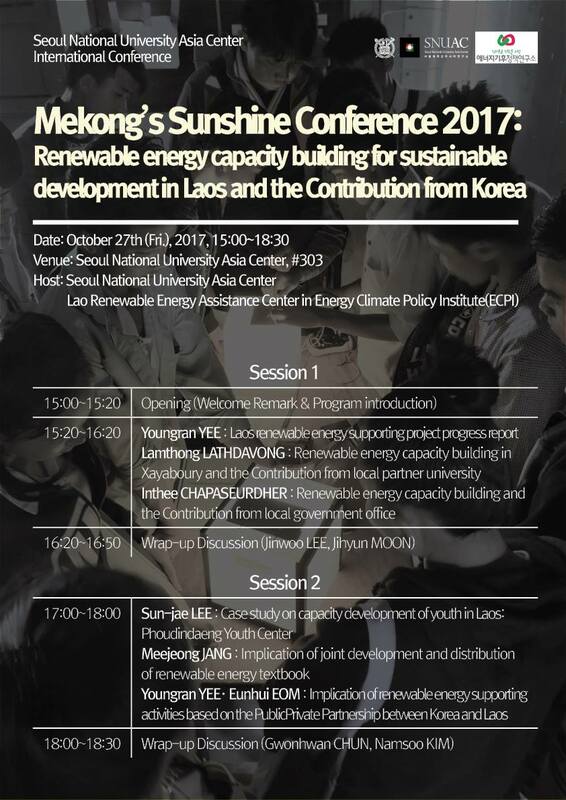 She’ll speak about ‘Meaning of renewable energy supporting activities based on the Public-Private Partnership between Korea and Laos’ with Youngran YEE. Seoul Energy Public Cooperation, Peace Village Network, Korea Research Institute for Environment & Development.